Exclusive Interview by James Stillerman – During Steve “The Dragon” Claggett (26-4-1, 17 KOs) current three-bout winning streak, he has won a pair of titles, winning ten-round unanimous decisions over two previously undefeated fighters, Yves Ulysse, Jr. (14-0) and Emmanuel Robles (15-0-1) while beating them in their hometowns. Claggett beat world-rated prospect Yves Ulysse, Jr. in his last outing in October to obtain the vacant IBF North America super lightweight title. He also defeated herald Emmanuel Robles (15-0-1) to claim the vacant WBA-NABA USA super lightweight title in September, 2016. With that victory, he became the first Calgarian boxer to win a junior welterweight title. The twenty-eight-year-old orthodox fighter has won six of his last seven bouts, the lone setback being a controversial loss to Chris van Heerden via a ten-round majority decision, in which most fans felt Claggett did more than enough to obtain the victory. 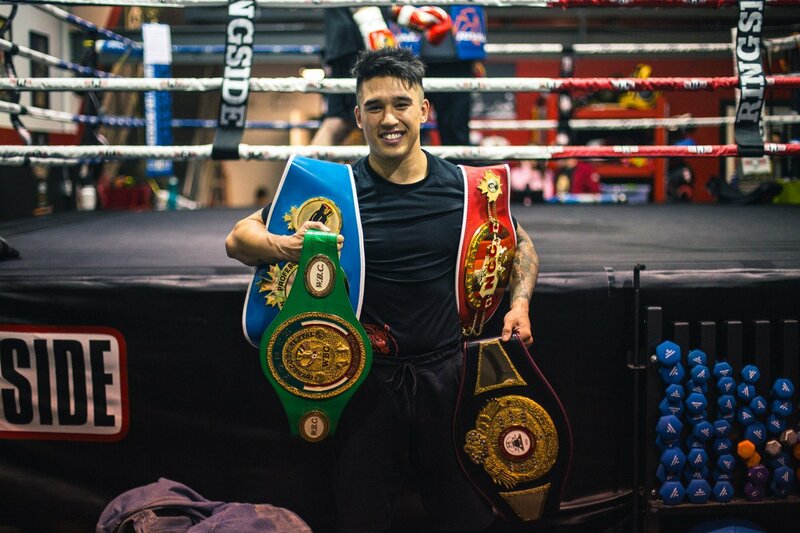 After Claggett’s loss to Heerden, he split with his longtime trainer Eric de Guzman whom he had been with him since he started boxing at the age of thirteen and teamed up with renowned Canadian-based Russian coach Vlad Goldenstein. Claggett also dropped down a division to 140-pounds. Together they are 3-0, 1 KO and Claggett is ranked in the top twenty by the IBF. At the beginning of this year, he signed with Knockout Night Boxing a Las Vegas-based promotional company who promotes Nico Hernandez (4-0, 3 KOs) a 2016 Olympic bronze medalist, along with a growing stable of professional fighters. Their first bout together will take place on St. Patrick’s Day (March 17th) at the famous House of Blues in the main event against popular New England star Danny O’ Connor (29-3, 11 KOs). O’ Connor is also currently on a three bout winning streak with two of those victories coming against undefeated boxers. O’Connor’s WBC Silver International junior welterweight title will be on the line for this bout. Their main event bout entitled “St. Patrick’s’ Day Clash 3” will be aired on pay-per-view as well as on Super Channel in Canada starting at 10 p.m. It will also be distributed in the United States by Integrated Sports Media on cable, satellite, and digital PPV via iN Demand, Vubiquity, DISH, and the Fite.TV app and website for $24.95. Claggett was gracious enough to take time out of his busy training camp to discuss with me his upcoming fight with O’ Connor, what it was like to defeat Ulysse, how he has resurrected his career, and much more. James Stillerman: How is training camp going? Steve Claggett: It is going awesome. I figured I would be fighting soon, so I have been training for the past several months and then three weeks out, I got the call that the fight was on. So I am more than ready for this bout, especially since I usually do not get this much time to prepare for a fight. James Stillerman: What are your thoughts of Danny O’ Connor? Steve Claggett: He is a real tough, gritty, durable southpaw boxer who can do a little bit of everything. I respect him and I know I am in for a great battle on the 17th. That being said, my trainer and I have watched a lot of his fights and we have come up with a good game plan that we believe will help us defeat him. James Stillerman: What do you need to do to beat O’Connor? Steve Claggett: I just need to stick to my game plan and if I do that, I will prevail. I need to use his main weakness, which in my opinion is his defense and exploit that with my strengthens which is an aggressive, non-stop, power-punching fighting style. I want to make this fight a ten-round war that is fought at an extremely fast pace in which I take the fight to him and make him extremely uncomfortable. If I can do that than my endurance, power, and experience fighting the better opposition will allow me to take over the fight in the later rounds and give me an opportunity to knock him out. James Stillerman: What was it like to defeat Ulysse in your last fight? Steve Claggett: It was such an amazing feeling. Not only was it great win over a ranked opponent that moved me up in the junior welterweight divisional rankings, but it was even more special since I was such a massive underdog going into that fight. Most of the media said I had absolutely no chance to win, yet I prevailed and I did it in his hometown. I have dedicated my entire life to this sport, so to beat Ulysse proves to me that my career is very much alive and that I can beat anyone, including O’ Connor. James Stillerman: What has been the biggest reason for your recent success? Steve Claggett: My trainer Vlad has been an integral part of resurrecting my career. Together we are 3-0 with two significant victories. The reason he has helped me so much is because he is a full time trainer, something that I have never had in my career. Before him, I had been mostly on my own. Now I have a trainer who is a student of the game. He studies and trains with me and pushes me to make progress every day. So far, the results have spoken for themselves. James Stillerman: What made you decide to move down to 140-pounds? Steve Claggett: Vlad has showed me how to properly cut weight. I should have always been fighting at 140-pounds which is my ideal weight for my power to be the most effective; however, until recently, I usually fought at welterweight because I struggled to cut weight. Before Vlad, I never had anyone show me how to properly cut weight. Once we teamed up, he demonstrated to me how to train, eat, and prepare myself leading up to the fight to allow myself to easily get down to 140. My last three bouts have been at 140, as well as this upcoming one against O’Connor. James Stillerman: What is it like to fight most of your bouts on the road? Steve Claggett: It is an interesting experience. I come into my opponents’ hometown and right away most of the fans hate me and boo me loudly, but you need to have thick skin and be mentally tough to be a professional boxer and not let it bother you. Fighting on the road has also given me an opportunity to travel the world and see places I might not otherwise visit. I have been to the Philippines, most of the major cities in Canada, California, and now Boston. At the end of the day, I want to show the world what I can do. I am a blood and guest warrior and fight fans can appreciate that even if they are rooting against me. James Stillerman: Do you think you beat Chris van Heerden? Steve Claggett: It was a close fight that could have gone either way. I personally though I won six of the ten rounds. I landed more punches and connected on the harder shots, but I am not going to complain about the judge’s’ decision because it was a really competitive bout. Nevertheless, I was in no mental shape for that fight. I had a lot going on in life, yet despite that I almost beat him in a bout that again no one gave me a chance to win. James Stillerman: How has your career gone thus far? Steve Claggett: It has been pretty good. I have had my fair share of ups and downs. It has been a trial by error ever since I turned professional at nineteen-years-old. Until three fights ago, I was mostly on my own without any full-time trainer or team; however, I really believe I am on the upswing and I am ready to take my career to the next level now that I have Vlad in my corner. Another big victory on the 17th could propel me to bigger and better bouts in the future and put me in a position to eventually fight for a world title. James Stillerman: What are your thought of your promoter Knock Out Night Boxing? Steve Claggett: This is our first of eight fights together. I have know the promoter John Anderson for a while and we are pretty good friends. I have fought on his shows before. He always puts on fights at great venues and treats his boxers well. We are both really excited about our partnership and expect big things to happen throughout our contract. James Stillerman: What are your fans like? Steve Claggett: I have the most amazing fans in the world and I know most boxers say that, but I really do. My fans have been extremely supportive of me even before I turned pro. Some of them have even traveled around the world to see me fight. Without them you do not have a sport and I would not be able to fight, so I owe them a lot. They give me the motivation to continue to fight, especially after losses and I never want to let them down again. I love my fans. I want to tell them thank you and I promise them that I will put on a great show in Boston and maybe even pick up more fans while I am there. Steve Claggett: I am really excited to be boxing in Boston. It is going to be a great fight on St. Patrick’s Day and one that boxing fans will certainly enjoy.